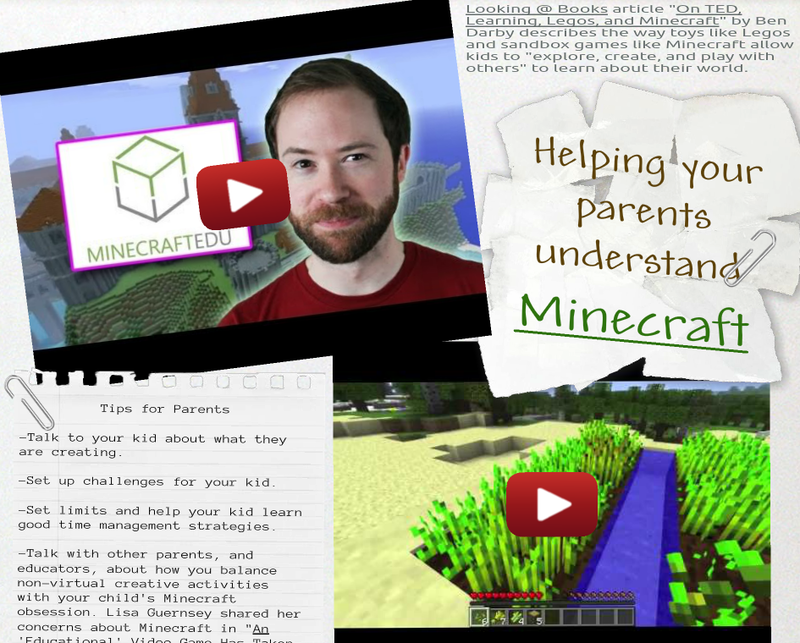 Glogster screen capture: Helping Your Parents Understand Minecraft. Glogster is a Web 2.0 Tool that makes it easy for librarians, teachers, and students to present media-rich information and links for further exploration about…well, about anything, really. Glogster features a palette of text boxes, frames, and upload and embed options that offer a balance between customization and ease of use in creating interactive online posters. My first experiment with Glogster yielded a Helping Your Parents Understand Minecraft reference glog, which I created with the help of my Minecraft-loving son. We embedded both an informational video from YouTube that explains the educational advantages of playing Minecraft, and a video that shows how the game is played. We also included links to Minecraft wikis, tutorials, opinion pieces (which expressed both appreciation for the game and concerns about the game), and links to other creative activities related to Minecraft. We also created original content in the form of Tips for parents and kids who were interested in learning more about the game. Glogster has a variety of applications in the library and classroom as a tool to gather information and resources, to summarize and present ideas, and to create and share original content. One other project my son and I collaborated to make was a glog that took a traditional English Language Arts Thinkmark to a more interactive level. We created a Thinkmark for the book Wonder. In this Thinkmark, we recorded our connections with the text, and then added links and embedded video that made our Thinkmark not just a list of connections, but a multi-media experience. I encourage you to go to Glogster or GlogsterEDU and check out the featured glogs, as well as the account options. You can sign up for Glogster for free or check out their options for inexpensive classroom accounts. While you are at it, click on the hyperlinked glog titles above to investigate the Glogster projects the Vagabond Boy and I worked on together!